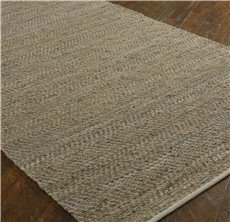 Uttermost Tobais 8 X 10 Rug - Beige, Best Seller! Rescued Italian Beige And Gray Leathers Hand Woven With Natural Hemp. This Rug Is Not Recommended For High Traffic Areas. Uttermost's Rugs Combine Premium Quality Materials With Unique High-style Design.